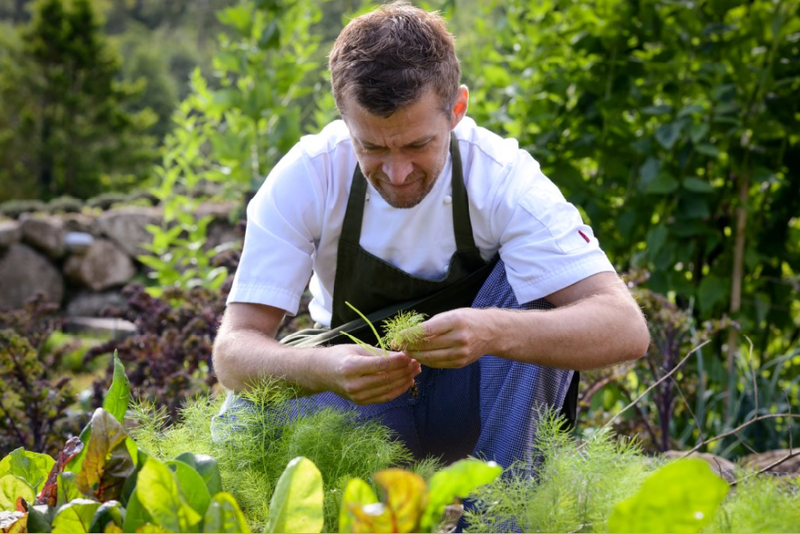 Michael Wignall, Executive Chef at luxury hotel and restaurant Gidleigh Park, is a keen forager, using ingredients he picks in the grounds of the hotel in his two Michelin-starred dishes. Foraged mushrooms, berries, cherries, woodruff, pennywort, sweet cicely, cob nuts, moss, juniper, elderflower, elderberries and wild burdock all feature highly on Michael's world-class menus. Michael says: "It would be a crime not to use the stunning, fresh produce that the land naturally produces. Foraging is also a great way to de-stress and take a few minutes away from the kitchen. It’s great 'thinking' space." He adds: "Some things grow right on the doorstep, or even along the walls that surround the estate, but others you have to look a bit harder for - and sometimes they're not in the most accessible or obvious of places, so some searching is required. Take a guided foraging tour with Michael Wignall, Executive Chef at two Michelin-starred restaurant Gidleigh Park. During this tour of the restaurant's grounds, Michael will show you how to find delicious seasonal ingredients such as woodruff, elderflower, elderberries, mushrooms and pennywort. The tour begins with morning coffee in front of the fire, followed by a half-hour foraging experience with Michael. Ingredients gathered, you'll head back to the restaurant for canapés and apéritifs, a three-course two Michelin-starred lunch, coffee and petits fours. £80 per person, including a glass of house wine per person. Minimum four people.